The Nation is in the midst of an unprecedented opioid epidemic. More than 130 people a day die from opioid-related drug overdoses. Prevention and access to treatment for opioid addiction and overdose reversal drugs are critical to fighting this epidemic. Primary care settings have increasingly become a gateway to better care for individuals with both behavioral health (including substance use) and primary care needs. The Health Resources and Services Administration (HRSA) supports its grantees with resources, technical assistance, and training to integrate behavioral health care services into practice settings and communities. In September 2018, HRSA awarded $352 million in new funding to expand access to substance use disorder and mental health services at community health centers across the nation. Previously, HRSA awarded $200 million in 2017 to expand mental health services and substance use disorder treatment and $94 million in 2016 through Substance Abuse Services Expansion funding. In September 2018, HRSA awarded $19 million as part of a new Rural Communities Opioid Response initiative in FY 18, including 95 planning grants to rural communities. These one-year planning grants are a part of a multi-year initiative being implemented by HRSA to increase access to treatment and recovery services for opioid use disorder within rural areas. HRSA also expanded the 2017 Rural Health Opioid Program, adding over $6 million in September 2018 to fund a total of 26 rural health organizations. HRSA is hosting a series of MCHB Grand Challenges to support tech innovations in health, including the Addressing Opioid Use Disorder in Pregnant Women and New Moms Challenge to improve access to substance use disorder treatment for pregnant women and new moms. HRSA and SAMHSA jointly support the Center for Integrated Health Solutions. This Center provides direct technical assistance resources to HRSA-funded safety-net providers; helping to integrate mental health and substance use disorder treatment within primary care settings, including medication-assisted treatment. HRSA supports testing evidence informed interventions for integrating behavioral health with primary medical care for people living with HIV; using an implementation science model to develop tools and resources for Ryan White HIV/AIDS Program provider sites. HRSA's 340B Drug Pricing Program supports affordable medication-assisted treatment. HRSA’s Title V Maternal and Child Health Services Block Grant Program allows states the flexibility to address high-need issues for maternal and child health, including screening tools for early detection of high-risk women and standardizing care for infants with neonatal abstinence syndrome. The Substance Abuse Treatment Telehealth Network Grant Program provides $700,000 for evidence-based, telehealth programs and networks to improve access to substance use disorder treatment in rural, frontier and underserved communities. Similarly, the Regional Telehealth Resource Center Program supports the development and advancement of telehealth programs in high-need communities. HRSA supports a Substance Use Warmline so primary care providers can access expert clinical consultation to assist them in caring for patients with substance use disorders. Roughly 150 health centers participate in a HRSA-funded Opioid Addiction Treatment (OAT) Extension for Community Healthcare Outcomes (ECHO) . This Project ECHO model is a virtual, national technical assistance effort to enhance health center capacity to treat substance use disorder, including medication assisted treatment and pain management. Additionally, through the Pain Management Extension for Community Health Outcomes (ECHO) Pilot , 20 health centers are developing evidence-based prescribing guidelines and non-pharmacological approaches for pain management and related behavioral health services, including opioid use disorder. TargetHIV helps providers caring for persons living with HIV/AIDS and includes a toolkit on integrating medication-assisted treatment in HIV primary care. State public health professionals can use the MCH Navigator to access learning tools to help mothers with opioid use disorder and infants with neonatal abstinence syndrome. 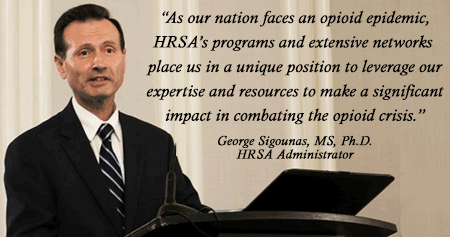 Through its ten regional offices, HRSA shares information and connects stakeholders to opioid resources. Staff take part in local, state, and federal opioid workgroups, taskforces, and meetings with local and state health departments and Tribal organizations. As part of the Rural Opioid Federal Interagency Working Group, HRSA’s Federal Office of Rural Health Policy contributed to create a new Federal Resource Guide for Substance Use Disorder in Rural Communities (PDF - 1.6 MB). This comprehensive guide organizes federal grant programs and resources specifically available to rural communities, in order to improve coordination and awareness of these federal resources. HRSA hosts webinars and regional events across the country that explore collaborative opportunities and ways to leverage expertise and resources to respond to the opioid crisis. HRSA events include the 2018 HIV/AIDS Bureau Partners meeting where participants discussed the impact of the opioid epidemic on Ryan White HIV/AIDS Program providers and patients. HRSA also participates in Department-wide events, including the 2017 Region 8 Opioid Summit in Denver, CO.
HRSA Rural Health Opioid Program grantees have shared best practices in using care coordination efforts for recovery. In September 2018, HRSA awarded $18.5 million to support Behavioral Health Workforce Education and Training (BHWET) and Enhancing Behavioral Health Workforce (EBHW). These awards support partnerships between 21 academic institutions and 54 HRSA-funded health centers. Together, these award recipients will increase the number of professionals and paraprofessionals who are trained to deliver integrated behavioral health and primary care services as part of health care teams in HRSA-supported health centers. Previously in 2017, HRSA provided over $4 million in supplemental funding for medication-assisted treatment training to nearly 60 Primary Care Training and Enhancement Program grantees. HRSA also funded Area Health Education Centers to develop and enhance health education and trainings - including on opioid use disorder prevention. Through the Health Center Program, HRSA provides extensive training and technical assistance to potential and existing health center grantees nationwide, including opioid use disorder treatment and pain management. HRSA-supported Rural Health Research Centers develop and disseminate research and policy briefs examining opioid use and treatment policies on the Rural Health Research Gateway . For example: a brief on the Changes in the Supply of Physicians with a DEA DATA Waiver to Prescribe Buprenorphine for Opioid Use Disorder (PDF - 1.4 MB). With HRSA support, the Association of State and Territorial Health Officials published a case study (PDF - 4.5 MB) that identified lessons learned and best practices for health officials from an analysis of Indiana’s response to the 2015 Hepatitis C Virus outbreak among injectable opioid users in Scott County. With HRSA support, the National Academy for State Health Policy released an October 2018 report entitled State Options for Promoting Recovery among Pregnant and Parenting Women with Opioid or Substance Use Disorder (PDF - 1 MB) with policy recommendations and lessons-learned from ongoing efforts in Colorado, Pennsylvania, and Texas. In 2017, HRSA awarded $17.1 million to support all 55 poison control centers’ efforts to prevent and provide treatment recommendations for poisonings, including from misuse of prescription and illicit opioids. The Rural Opioid Overdose Reversal Program Best Practices Guide (PDF - 1.9 MB) provides a summary of lessons learned from HRSA’s Rural Opioid Overdose Reversal Program that supported overdose education and naloxone distribution programs in rural communities. Questions about HRSA's efforts to combat the opioid epidemic? *Their contents are solely the responsibility of the authors and do not necessarily represent the official views of HRSA.